This is one of the prettiest bikes that’s come in as a donation at Bikeworks North. 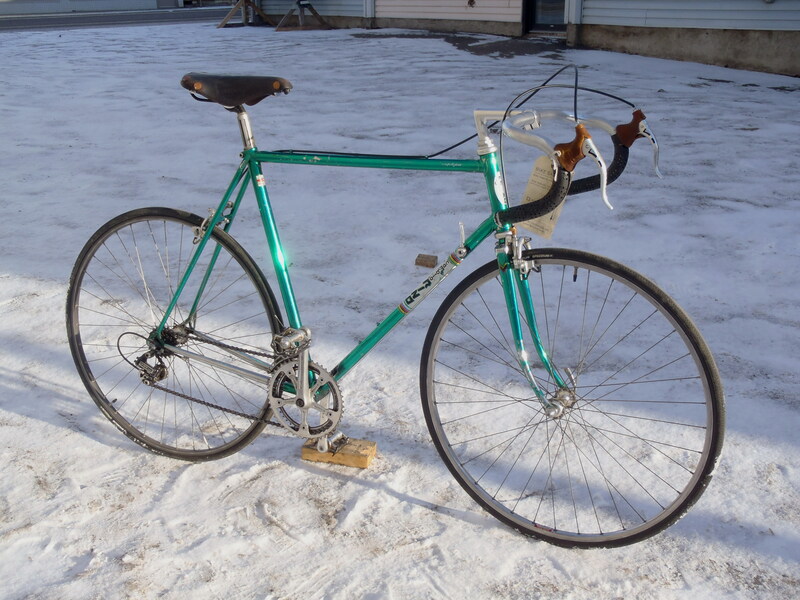 I don’t know much about Italian road bikes, vintage or otherwise, but I think this is a sweet ride. There is some conflicting information out there on the Cambio Rino company, but I found this concise summary at Disraeli Gears. This bike has Rino branded hubs, headset, derailleurs, seatpost and shifters. Some of the other components include Universal brakes & levers, Wolber rims and a nice copper riveted Brooks saddle. I have to be shallow and admit that my favourite thing about this bike is the luscious green paint job. The paint is mostly in good shape but is flaking off at a few points showing the chrome beneath. Click on a few of the photos below to get a better look at the colour. A few other nice details are the pretty, but not overly ornamental, lugs and the Rino logos on the fork crown and seat stays. I also like the shifters which are nicely ornamented, and with the rear shift lever having a pleasant curve. This bike has been tempting me for several months now even though it’s a smidge too big for me at 58cm. It’d be great if somebody dropped by the shop and bought it so I could stop mulling the possibility of adding an Italian bike to my little fleet. 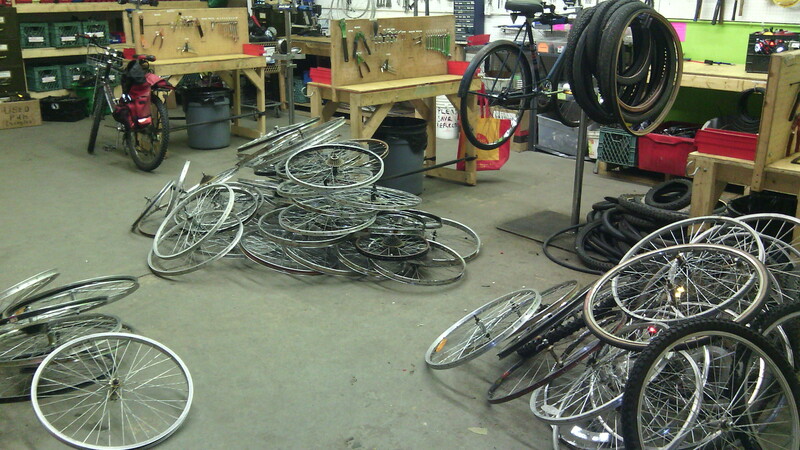 Having finished a prolonged drive to strip down the bikes of the lesser water at Bikeworks North, we now have a lot of parts to sort out. 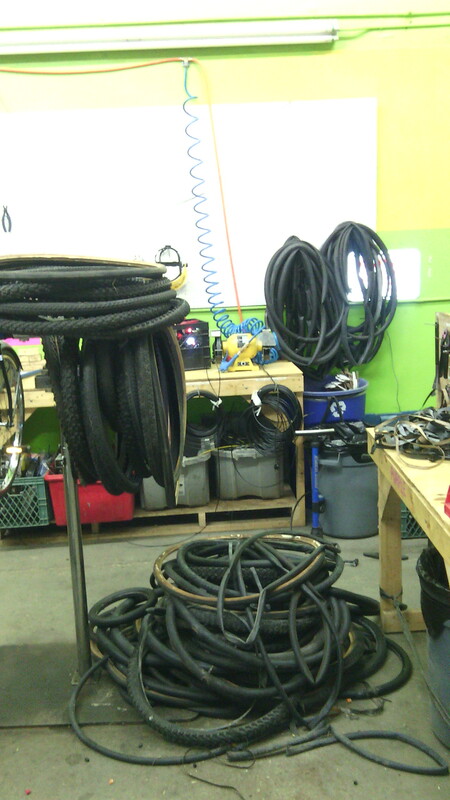 This picture shows maybe one fifth of the wheels to be sorted into scrap and keepers. Where there are wheels there are tires.